Things had changed from when he had first thrust himself into contention at THE PLAYERS Championship. That was three years earlier, in 1996 when David Duval was a second-year PGA TOUR member who had not yet won. But in the spring of 1999, Duval was an impressive force. 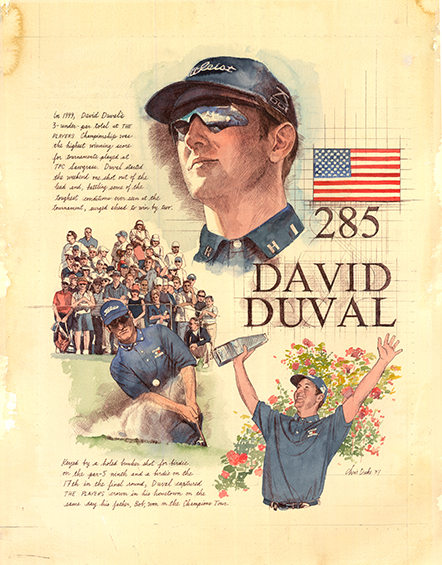 Now 27, Duval had nine PGA TOUR wins, including one which came via a final-round 59. THE PLAYERS Stadium Course at TPC Sawgrass was firm, fast and tough — conditions that suited Duval’s focused personality. He was a kid from Jacksonville Beach. Just a few hours down the Florida coast, Duval’s father, Bob, was in contention at a PGA TOUR Champions tournament. You could say the stars were aligned, and in these heady days, Duval didn’t squander opportunities like this. Nursing a one-stroke lead in punishing conditions, Duval stuffed his tee shot at the island-green 17th, made birdie, and at 3-under 285 he held off Scott Gump by one. It remains the highest winning score at the Stadium Course, a testament to Duval’s unflappable demeanor. But it also remains an unforgettable day for Duval — it was his 10th win in a 33-tournament stretch, it came before hometown folks, it was a $900,000 payday from a $5 million purse, and he jumped to No. 1 in the world. Most of all, his father won, too, a father-son act that made PGA TOUR history. “I told him to embrace thoughts of winning,” David said, when asked if he counseled his father Saturday night. Sound advice he himself followed. A Jacksonville native who had spent much of his youth coming to TPC Sawgrass to watch his heroes compete, Duval claimed victory at THE PLAYERS Championship, simultaneously becoming the world’s number one golfer in doing so.